Rice noodle salad is something I make on emergency or out of the blue. I pretty much have all ingredients ready in my fridge and pantry. Although it is a relatively easy dish to make, the freshness from veggies and herbs plus a beautiful Asian dressing makes it so special and flavoursome. Coriander is one of my favorite herbs in Asian dish. Did you know it actually belongs to a carrot family? It is rich in essential vitamins and minerals – Vitamin A, B, C, K, iron, magnesium, potassium and calcium. Your skin loves coriander because it reduces acne and provides protection from eczema, dryness and fungal infections. The rich aroma helps in the proper secretion of enzymes and digestive juices in the stomach, helping your digestion. Good news for women? it helps regulate proper menstrual cycles and reduces the associated pain during period. It also helps to regulate your blood sugar level, blood pressure and cholesterol levels. Such a shame I tried to grow them in my garden a few times, but all failed! In fact, I didn’t have much luck with basil and parsley either. I don’t think they like me 🙁 Does anyone have some good tips with gardening? Cook the rice noodles in a boiling water for a few minutes until tender, drain, rinse under cold water and set aside. 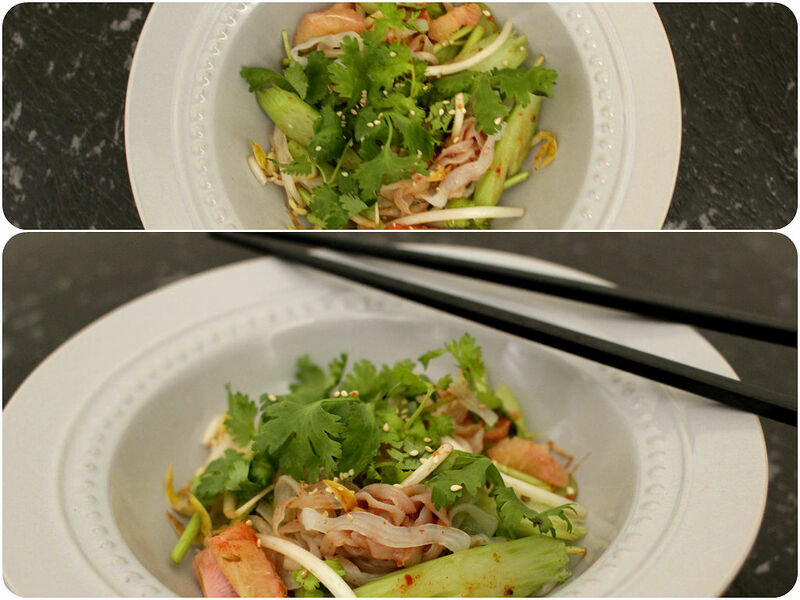 Finely shred cabbage, slice celery, desegment grapefruit and roughly chop coriander. Mix cooked noodles and prepared vegetables in a large bowl. Pour the half of the dressing into a bowl and gently toss to combine. Transfer to a serving bowl and drizzle the rest of the dressing over the salad.